Sensitivity (also called the true positive rate, the recall, or probability of detection in some fields) measures the proportion of actual positives that are correctly identified as such (e.g., the percentage of sick people who are correctly identified as having the condition). Specificity (also called the true negative rate) measures the proportion of actual negatives that are correctly identified as such (e.g., the percentage of healthy people who are correctly identified as not having the condition). Note that the terms "positive" and "negative" don't refer to the value of the condition of interest, but to its presence or absence. The condition itself could be a disease, so that "positive" might mean "diseased", while "negative" might mean "healthy". 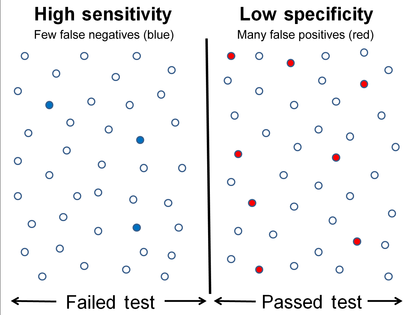 In medical tests sensitivity is the extent to which actual positives are not overlooked (so false negatives are few), and specificity is the extent to which actual negatives are classified as such (so false positives are few). 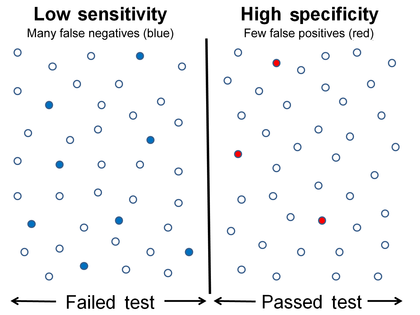 Thus a highly sensitive test rarely overlooks an actual positive (for example, showing "nothing bad" despite something bad existing); a highly specific test rarely registers a positive classification for anything that is not the target of testing (for example, finding one bacterial species and mistaking it for another closely related one that is the true target); and a test that is highly sensitive and highly specific does both, so it "rarely overlooks a thing that it is looking for" and it "rarely mistakes anything else for that thing." Because most medical tests do not have sensitivity and specificity values above 99%, "rarely" does not equate to certainty. But for practical reasons, tests with sensitivity and specificity values above 90% have high credibility, albeit usually no certainty, in differential diagnosis. Sensitivity therefore quantifies the avoiding of false negatives and specificity does the same for false positives. For any test, there is usually a trade-off between the measures – for instance, in airport security, since testing of passengers is for potential threats to safety, scanners may be set to trigger alarms on low-risk items like belt buckles and keys (low specificity) in order to increase the probability of identifying dangerous objects and minimize the risk of missing objects that do pose a threat (high sensitivity). This trade-off can be represented graphically using a receiver operating characteristic curve. A perfect predictor would be described as 100% sensitive, meaning all sick individuals are correctly identified as sick, and 100% specific, meaning no healthy individuals are incorrectly identified as sick. In reality, however, any non-deterministic predictor will possess a minimum error bound known as the Bayes error rate. The values of sensitivity and specificity are agnostic to the percent of positive cases in the population of interest (as opposed to, for example, precision). The terms "sensitivity" and "specificity" were introduced by the American biostatistician Jacob Yerushalmy in 1947 . In the terminology true/false positive/negative, true or false refers to the assigned classification being correct or incorrect, while positive or negative refers to assignment to the positive or the negative category. A negative result in a test with high sensitivity is useful for ruling out disease. A high sensitivity test is reliable when its result is negative, since it rarely misdiagnoses those who have the disease. A test with 100% sensitivity will recognize all patients with the disease by testing positive. A negative test result would definitively rule out presence of the disease in a patient. A positive result in a test with high sensitivity is not useful for ruling in disease. Suppose a 'bogus' test kit is designed to show only one reading, positive. When used on diseased patients, all patients test positive, giving the test 100% sensitivity. However, sensitivity by definition does not take into account false positives. The bogus test also returns positive on all healthy patients, giving it a false positive rate of 100%, rendering it useless for detecting or "ruling in" the disease. Sensitivity is not the same as the precision or positive predictive value (ratio of true positives to combined true and false positives), which is as much a statement about the proportion of actual positives in the population being tested as it is about the test. The calculation of sensitivity does not take into account indeterminate test results. If a test cannot be repeated, indeterminate samples either should be excluded from the analysis (the number of exclusions should be stated when quoting sensitivity) or can be treated as false negatives (which gives the worst-case value for sensitivity and may therefore underestimate it). A positive result in a test with high specificity is useful for ruling in disease. The test rarely gives positive results in healthy patients. A test with 100% specificity will read negative, and accurately exclude disease from all healthy patients. A positive result signifies a high probability of the presence of disease. A test with a higher specificity has a lower type I error rate. In medical diagnosis, test sensitivity is the ability of a test to correctly identify those with the disease (true positive rate), whereas test specificity is the ability of the test to correctly identify those without the disease (true negative rate). If 100 patients known to have a disease were tested, and 43 test positive, then the test has 43% sensitivity. If 100 with no disease are tested and 96 return a negative result, then the test has 96% specificity. Sensitivity and specificity are prevalence-independent test characteristics, as their values are intrinsic to the test and do not depend on the disease prevalence in the population of interest. Positive and negative predictive values, but not sensitivity or specificity, are values influenced by the prevalence of disease in the population that is being tested. These concepts are illustrated graphically in this applet Bayesian clinical diagnostic model which show the positive and negative predictive values as a function of the prevalence, the sensitivity and specificity. It is often claimed that a highly specific test is effective at ruling in a disease when positive, while a highly sensitive test is deemed effective at ruling out a disease when negative. This has led to the widely used mnemonics SPPIN and SNNOUT, according to which a highly SPecific test, when Positive, rules IN disease (SP-P-IN), and a highly 'SeNsitive' test, when Negative rules OUT disease (SN-N-OUT). Both rules of thumb are, however, inferentially misleading, as the diagnostic power of any test is determined by both its sensitivity and its specificity. The tradeoff between specificity and sensitivity is explored in ROC analysis as a trade off between TPR and FPR (that is, recall and fallout). Giving them equal weight optimizes Informedness = Specificity+Sensitivity-1 = TPR-FPR, the magnitude of which gives the probability of an informed decision between the two classes (>0 represents appropriate use of information, 0 represents chance-level performance, <0 represents perverse use of information). where function Z(p), p ∈ [0,1], is the inverse of the cumulative Gaussian distribution. d' is a dimensionless statistic. A higher d' indicates that the signal can be more readily detected. Hence with large numbers of false positives and few false negatives, a positive screen test is in itself poor at confirming the disorder (PPV = 10%) and further investigations must be undertaken; it did, however, correctly identify 66.7% of all cases (the sensitivity). However as a screening test, a negative result is very good at reassuring that a patient does not have the disorder (NPV = 99.5%) and at this initial screen correctly identifies 91% of those who do not have cancer (the specificity). Sensitivity and specificity values alone may be highly misleading. The 'worst-case' sensitivity or specificity must be calculated in order to avoid reliance on experiments with few results. For example, a particular test may easily show 100% sensitivity if tested against the gold standard four times, but a single additional test against the gold standard that gave a poor result would imply a sensitivity of only 80%. A common way to do this is to state the binomial proportion confidence interval, often calculated using a Wilson score interval. Confidence intervals for sensitivity and specificity can be calculated, giving the range of values within which the correct value lies at a given confidence level (e.g., 95%). In information retrieval, the positive predictive value is called precision, and sensitivity is called recall. Unlike the Specificity vs Sensitivity tradeoff, these measures are both independent of the number of true negatives, which is generally unknown and much larger than the actual numbers of relevant and retrieved documents. This assumption of very large numbers of true negatives versus positives is rare in other applications. In the traditional language of statistical hypothesis testing, the sensitivity of a test is called the statistical power of the test, although the word power in that context has a more general usage that is not applicable in the present context. A sensitive test will have fewer Type II errors. ^ "Detector Performance Analysis Using ROC Curves – MATLAB & Simulink Example". www.mathworks.com. Retrieved 11 August 2016. ^ Yerushalmy J (1947). "Statistical problems in assessing methods of medical diagnosis with special reference to x-ray techniques". Public Health Reports. 62 (2): 1432–39. doi:10.1177/0272989X9401400202. PMID 8028462. ^ a b Fawcett, Tom (2006). "An Introduction to ROC Analysis" (PDF). Pattern Recognition Letters. 27 (8): 861–874. doi:10.1016/j.patrec.2005.10.010. ^ a b c Powers, David M W (2011). "Evaluation: From Precision, Recall and F-Measure to ROC, Informedness, Markedness & Correlation" (PDF). Journal of Machine Learning Technologies. 2 (1): 37–63. ^ Ting, Kai Ming (2011). Encyclopedia of machine learning. Springer. ISBN 978-0-387-30164-8. ^ a b Altman DG, Bland JM (June 1994). "Diagnostic tests. 1: Sensitivity and specificity". BMJ. 308 (6943): 1552. doi:10.1136/bmj.308.6943.1552. PMC 2540489. PMID 8019315. ^ "SpPins and SnNouts". Centre for Evidence Based Medicine (CEBM). Retrieved 26 December 2013. ^ Mangrulkar R. "Diagnostic Reasoning I and II". Retrieved 24 January 2012. ^ "Evidence-Based Diagnosis". Michigan State University. Archived from the original on 2013-07-06. Retrieved 2013-08-23. ^ "Sensitivity and Specificity". Emory University Medical School Evidence Based Medicine course. ^ Baron JA (Apr–Jun 1994). "Too bad it isn't true". Medical Decision Making. 14 (2): 107. doi:10.1177/0272989X9401400202. PMID 8028462. ^ Boyko EJ (Apr–Jun 1994). "Ruling out or ruling in disease with the most sensitive or specific diagnostic test: short cut or wrong turn?". Medical Decision Making. 14 (2): 175–9. doi:10.1177/0272989X9401400210. PMID 8028470. ^ Pewsner D, Battaglia M, Minder C, Marx A, Bucher HC, Egger M (July 2004). "Ruling a diagnosis in or out with "SpPIn" and "SnNOut": a note of caution". BMJ. 329 (7459): 209–13. doi:10.1136/bmj.329.7459.209. PMC 487735. PMID 15271832. ^ Gale SD, Perkel DJ (January 2010). "A basal ganglia pathway drives selective auditory responses in songbird dopaminergic neurons via disinhibition". The Journal of Neuroscience. 30 (3): 1027–37. doi:10.1523/JNEUROSCI.3585-09.2010. PMC 2824341. PMID 20089911. ^ Macmillan NA, Creelman CD (15 September 2004). Detection Theory: A User's Guide. Psychology Press. p. 7. ISBN 978-1-4106-1114-7. ^ "Diagnostic test online calculator calculates sensitivity, specificity, likelihood ratios and predictive values from a 2x2 table – calculator of confidence intervals for predictive parameters". medcalc.org. Altman DG, Bland JM (June 1994). "Diagnostic tests. 1: Sensitivity and specificity". BMJ. 308 (6943): 1552. doi:10.1136/bmj.308.6943.1552. PMC 2540489. PMID 8019315. Loong TW (September 2003). "Understanding sensitivity and specificity with the right side of the brain". BMJ. 327 (7417): 716–9. doi:10.1136/bmj.327.7417.716. PMC 200804. PMID 14512479. This page was last edited on 5 April 2019, at 08:58 (UTC).